The mystery of these times : massive monetary evaporation. Where did all that cash elope to? No one is ready to tell the tale. We can’t tell where it went, maybe we can tell where it came from. That might give us a clue. Paul Grignon made a documentary on that subject, a video titled Money As Debt. The video has been around for a while, but I thought it might be pertinent to revisit it here. Additional related material on the subject is available in wikipedia under the topics Money Creation, and Fractional-reserve Banking. To me, the most disturbing aspect of all this is the degree to which popular conception differs from what is stated in the sources above. Except for graduates of Economics, who by-the-way often confessed only fuzzy understanding of the Multiplier Effect and Fractional-reserve Banking, everyone I shared this video with expressed complete and utter surprise at its contents. This is the way the guts of our world works, and we barely know it. Subsequently I find my mind reeling at the idea that the primary repository of value in the gargantuan global financial system is debt. Debt backed by debt, backed by debt backed by nothing much. Extending a loan is ultimately a statement of faith, in the debtor’s future ability to fulfill obligations. Using this faith as the foundation of the entire monetary system rests upon the belief that an interest bearing debt is more valuable than the money used to create it. But what happens when that faith is misplaced? What happens when money is lent for ends of dubious economic value? Like gambling with random variables (see Fooled by Randomness: The Hidden Role of Chance in Life and in the Markets by Nassim Nicholas Taleb, 2005). Or waging wars which — even if they had a point or were necessary — are destroyers not creators of value. What happens when good loans go bad? Supposedly the Central Bank (in the case of the USA, it is the Federal Reserve System) would step in, and save the day. But the reserve rate is usually much smaller than 100%. For example, in the case of the USA, the reserve rate is 10%. Which means that every dollar lent out is backed by a mere dime. So, if enough debts go bad, the reserve can’t cover it. District of Columbia, we have a problem. 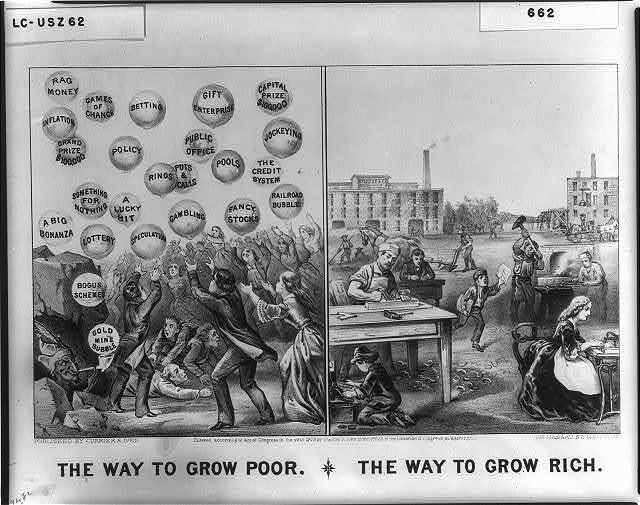 Someone sent me a very thought provoking 1875 print by Currier & Ives, pictured below. Apparently the current state of affairs is a near century old dejavu. There is hope in this picture. Maybe the so-called crisis will teach this generation a lesson in age-old basics of true economic values. This entry was posted on October 9, 2008 at 12:38 am and is filed under Money, Politics with tags bailout, Banks, Crisis, economy, Federal Reserve, Finance, Fractional Reserve Lending, Money, Money As Debt, Money Creation, Politics. You can follow any responses to this entry through the RSS 2.0 feed. You can leave a response, or trackback from your own site. Before i had heard of this caper, i must say only darkness prevailed in my mind with respect to questions like, “where does money come from”?? It is as though a veil has been lifted…..